Shopping for a new or pre-owned vehicle is not always easy. Determining the right one for you can take time, especially if you've never quite found the right fit yet. Looking for the straightforward value of a car, the capability of a pickup truck, the spacious quality of a minivan, or the versatility of an SUV? 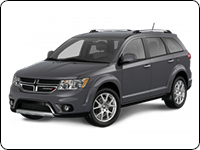 Only one brand offers the best advantages where they matter in their respective vehicle category-that brand is Dodge, offering a full line of world-class vehicles and a Canadian favourite. Dodge isn't just about making cars that take you from point A to point B. They are about providing top-quality vehicles that excel where they need to, and surpass expectations even further with Best-in-Class features and class-exclusive advantages that no other make can offer. Take for example the legendary status of the Dodge Challenger, the most powerful muscle car ever built, or the world's most powerful sedan, the Charger. 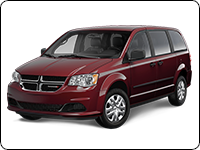 Think of the decades of service provided by Canada's favourite minivan, the Grand Caravan. Picture the adventures, both urban and in the Great Outdoors, unlocked by the remarkably adaptable and class-defining Journey. 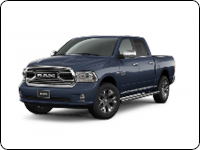 And who can forget the award-winning capability of Dodge RAM trucks, Canada's longest-lasting line of light- and heavy-duty pickups? All follow an intentional trend-they are the best at what they do, because that's what Dodge strives to accomplish. So where do you start? With a dealership that has decades of customer-facing values, a long tradition of family-oriented operations, and good old-fashioned, friendly service that makes you feel like part of the family. At Bustard Chrysler, we don't just sell cars-we make sure you have a remarkable purchasing and ownership experience with the vehicle you get from us. 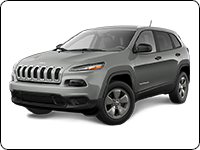 We offer a full line of Dodge, Jeep, Chrysler and RAM vehicles, new and used, and we are confident we have the perfect one for you just waiting for you to get behind the wheel. Not sure what you need? Our highly knowledgeable sales staff will assist you in determining what best suits your needs personally, and get you in the vehicle that you'll love. View our selection conveniently online, or call us up, and get started on the first step toward having a vehicle worth talking about! Think our role ends with you driving away with your new set of wheels? Think again. We are fully equipped and certified for servicing, with a technician staff of trained, factory certified and talented individuals who will ensure your vehicle stays in top shape for the long run. We also carry genuine auto parts that are guaranteed to work the best for your particular model. On top of that, we offer full detailing service to keep your vehicle looking as fresh and new as the day you bought it. With Bustard Chrysler, you and your vehicle are in good hands. Bustard Chrysler may stem from a long-standing tradition of family values, but we look to the present and the future as much as to our roots. We are not only active with our community, both online and right here in Waterloo, but we go above and beyond to serve our internet customers as well. If you send us an inquiry, unlike other dealerships that use a third party for your information, we serve you directly with our in-house Team Digital-digital experts who will assist you quickly and personally before you ever even set foot on our lot. At Bustard Chrysler, we want you to be happy with your vehicle for the duration you have it. Beyond our showroom, we also provide a wide variety of maintenance services including oil changes, tire pressure monitoring, rotations and alignments, as well as diagnosing and repairing brakes, rotors, air conditioning, shocks, suspension, struts, battery, alternator and other electrical issues. We also provide up-to-date recall information whenever required. And yes, we even sell tires! 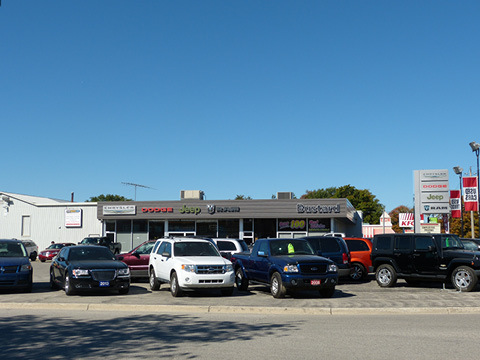 Come make Bustard Chrysler your Number One stop for all of your Dodge, Chrysler, Jeep, and RAM needs! Part of our relationship with the community extends to our connections to banks and lenders, which means our finance department has the most competitive financing programs to get you driving the vehicle you want, regardless of your credit history!